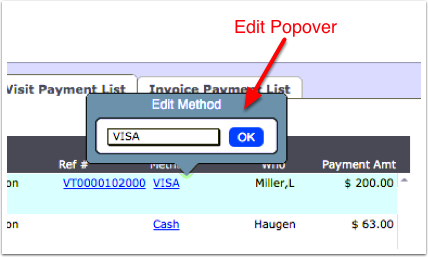 Navigate to the Visit Payment List or the Client Payment List tab. Click either the Method or Reference blue link for the payment. 3. In the edit popover that opens, make the changes. If the blue link is not visible, the user does not have the proper PRIV or the payment has been recon- ciled.